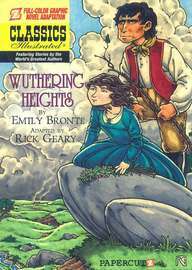 Emily Bronte's romantic masterpiece established the quintessentially dark, brooding antihero in the form of the character Heathcliffe when first published. Heavily influenced by the poet Lord Byron, the beautiful flow of her words is matched by Rick Geary's art in this comics adaptation. Fan favorite and award-winning artist and writer Rick Geary's work was seen in Papercutz' CLASSICS ILLUSTRATED #1 "Great Expectations."